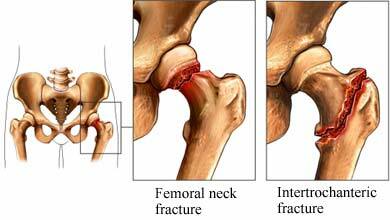 A hip fracture is a break in the thigh bone. The break happens just below the hip joint. The thigh bone has a ball at the top of the bone. The hip joint includes this ball and a socket in the pelvis. Most hip fractures occur in the 1 to 2 inches just below the ball portion of the hip. A hip fracture is caused by trauma to the bone. Fractures in young people with healthy bones are caused by major trauma. The most common is a car accident. Older adults or people with conditions that weaken bones may be caused by minor trauma, such as a fall. You will be asked about your symptoms. You may be asked about any recent falls or injury details. A physical exam will be done. Surgery is needed for most hip fractures. This will make sure the hip heals properly. Surgery will also allow you to move about as you recover. Plates and screws will be used over the area. They will help to align the bones and support them while they heal. Hip replacement may be needed. Damaged areas are removed. A metal devices is inserted in its place. This options is reserved for those with severe bone injury. It is more common in older adults. Your doctor may recommend devices to help you start walking. This may include a wheelchair, cane, or walker. Surgery is not a good option for some people. Those with a small fractures or poor overall health may need to let the bone heal on its own. The fracture will be monitored with imaging tests. This will make sure it is healing properly. Traction may also be used. It can hold the leg in place while the bone heals. A physical therapist will assess the hip fracture. An exercise program can strengthen the muscles help recovery. They may also help reduce the risk of future falls. Major trauma is often caused by accidents and hard to avoid. Work with your doctor if you have a condition that can weaken the bone. Medicine, changes to the diet, and weight bearing activities may help slow bone loss. Ask your doctor if any of your medicine may cause lightheadedness, drowsiness, or confusion. Get your eyes checked regularly. Hip fracture. EBSCO DynaMed Plus website. Available at: http://www.dynamed.com/topics/dmp~AN~T116789/Hip-fracture. Updated January 26, 2018. Accessed March 5, 2018. Hip fracture prevention. Ortho Info—American Academy of Orthopaedic Surgeons website. Available at: http://orthoinfo.aaos.org/topic.cfm?topic=A00309. Updated January 2013. Accessed March 5, 2018. Ly, Thuan V and Swiontkowski, Marc F Management of femoral neck fractures in young adults. Indian J Orthop. 2008 Jan-Mar; 42(1): 3–12. van Diepen S, Majumdar SR, Bakal JA, McAlister FA, Ezekowitz JA. Heart failure is a risk factor for orthopedic fracture: a population-based analysis of 16,294 patients. Circulation. 2008;118(19):1946-52. 11/6/2009 DynaMed Plus Systematic Literature Surveillance http://www.dynamed.com/topics/dmp~AN~T116789/Hip-fracture: Sennerby U, Melhus H, Gedeborg R, et al. Cardiovascular diseases and risk of hip fracture. JAMA. 2009;302(15):1666-1673. 1/4/2011 DynaMed Plus Systematic Literature Surveillance http://www.dynamed.com/topics/dmp~AN~T116789/Hip-fracture: Lee JS, Buzková P, Fink HA, et al. Subclinical thyroid dysfunction and incident hip fracture in older adults. Arch Intern Med. 2010;170(21):1876-1883. 4/24/2014 DynaMed Plus Systematic Literature Surveillance http://www.dynamed.com/topics/dmp~AN~T116789/Hip-fracture: Ward RJ, Weissman BN, et al. ACR Appropriateness Criteria for acute hip pain: suspected fracture. Available at: http://www.acr.org/~/media/ACR/Documents/AppCriteria/Diagnostic/AcuteHipPainSuspectedFracture.pdf. Published 2013. Accessed February 11, 2016.